This episode catches up with the Klingons and thanks to some superb performances and a couple of unbelievable revelations, Point of Light is another excellent hour of TV. The Klingons are back and better than ever in Star Trek Discovery season 2, episode 3, Point of Light. 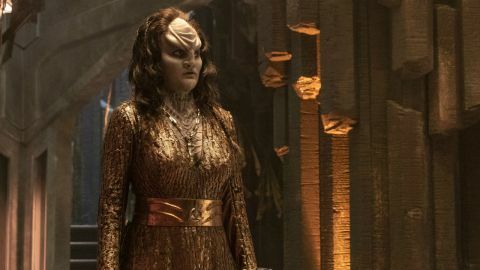 Discovery and its crew takes a bit of backseat in this latest episode as we catch up with L’Rell (Mary Chieffo) and Tyler (Shazad Latif) on the Klingon homeworld for a dose of blood-thirsty political intrigue. Thanks to the strong performances we’ve come to expect from both Chieffo and Latif, coupled with a shocking revelation about their relationship, Point of Light is a welcome reminder why it’s worth steering away from the stars every now and again. With mild spoilers from this point on, here’s our verdict on Star Trek Discovery season 2, episode 3. With the first couple of episodes establishing Discovery’s new course, it’s now time to turn our attention to the other much-loved characters from Star Trek Discovery season 1 who aren’t aboard the starship. While it will come as no surprise to any fans who’ve been paying attention to casting announcements about the second season that both Chieffo and Latif are back, there are definitely some questions being asked about how they would be worked into the second season’s storyline. Thankfully, if Point of Light is any indication of what’s to come, the writers have expertly maneuver both characters into positions full of potential without diminishing the events of the Star Trek Discovery season 1 ending. Chancellor L’Rell is hard at work establishing her leadership and cementing the unification of the Klingon Empire after the war, and we quickly realise that having Tyler at her side isn’t doing her any favours. The other Klingons see him as nothing more than a human despite his connection to Voq, and Tyler himself still struggles with his duel personalities pulling him in different directions. As L’Rell’s torchbearer, he’s as strong and ruthless as any Klingon, but in private he cannot hide the change that the transformation has over him. Both Chieffo and Latif remind you within seconds why their characters are so captivating, and there’s a particularly touching exchange between the pair, which hints at the torment they both suffer being together… and yet not being together. It says a lot that a Star Trek show can so expertly convey such a complex relationship - something which none of the previous Trek series manage. Despite the interest in the current Klingon set-up, it’s clear that L’Rell and Tyler have to be separated to continue with their (no doubt very different) season 2 storylines. After all, Tyler obviously needs to reconnect with Burnham, and L’Rell has an Empire to rule. If you’re worried about just how the show was going to manage that (I know I was! ), you can breathe easy as the core storyline of Point of Light is so intriguing, exciting, and shocking that you don’t even realise until the very end that it’s left both characters in perfect positions for what’s to come, without awkwardly killing anyone off, making up some unbelievable excuse, or creating a plot hole. Not only that, but the heart-breaking events of the episode (I’m not going to go into details because you really deserve to watch it for yourself), adds an extra richest to their characters and their relationship, which they didn’t need, but is still so well done, you’ll want to stand up and applaud by the end. Then there’s the other returning character who put in an appearance in episode 3. Oh Emperor... sorry, Georgiou (Michelle Yeoh), how we’ve missed you! Again, if you’ve been paying any attention to the news surrounding Star Trek Discovery season 2 then you’ll already know that Yeoh was returning and that the Emperor has joined the mysterious Federation black ops unit Section 31. It’s the perfect fit for the character and thankfully, there’s already a spin-off in the works because after this episode, everyone will be clamoring for more! For now though, the Emperor remains satisfied with merely dropping in, saving everyone, and then leaving again with everything she wants… Even with limited screen time - and in an already standout episode - she manages to be one of the best things about Point of Light, and I can’t wait to see more of her. Not to mention her new Captain, Leland (Alan van Sprang), who merely cameoed in episode 3, but promises so much more. Back on the Discovery, Tilly’s new ‘friend’ is causing her problems as she’s trying to impress Captain Pike and succeed in the Command Training Programme. Thankfully, Discovery keeps up its usual fast pace and before the episode is done, we have an answer for what’s going on with everyone’s favourite Ensign - despite the mystery being far from over. On the other side of the spectrum, the whole ‘Where is Spock’ storyline is in danger of dragging on too long. For three straight episodes now, Spock and his connection to the red signals/angel has been at the heart of events, and for three straight episodes Discovery has been teasing the appearance of the iconic Original Series character. While the appearance of Burnham and Spock’s mother Amanda (Mia Kirshner) in this episode is a welcome one, if the show keeps this up much longer, viewers are going to become frustrated with the constant talk, but lack of Spock. Hopefully, he’ll put in an appearance soon. With Point of Light, Star Trek Discovery turns in another excellent hour of TV, which will convince anyone who was worried otherwise, that the first season was no one-hit wonder. Barring the constant mention of the absent Spock, episode 3 - much like the show as whole - barely puts a foot wrong, ensuring that everything which happens off the USS Discovery is just as compelling as what happens on the starship. How it will all join up remains to be seen, but with 11 episodes to go and a proven track record for weaving complex mysteries together, fans can rest assured that only good things await them. For more must-watch series, check out the new TV shows coming to a small screen near you soon.